On the trail, and on the hunt. Last Saturday the Girl and I rose quite early to get out and hike (and geocache) before the heat rose. The story is already told, but a further rumination rose a few minutes ago. I suppose when the Muse calls me, I better answer. I was scrolling through recent images collected and stored on my computer and came across this capture. It was made after our climb-out and while we were hiking along the ridge of the Prison Hill Range. This is a view of the Girl I see often when we’re out in the sageland. She runs back and forth, doing her favorite thing — hunting. She’s a high-drive dog and will chase rabbits, squirrels, and lizards. I know her well and have learned to manage her drive for the most part. I am still sometimes surprised, bu far less often than I was a few years ago. This is something that is just part of her. I accept that and watch for those times when it might be a problem. I’m OK with that as well. So we hike and hunt. It fills a need that she has and a need that I have. We both gain a lot from our time on the trail. 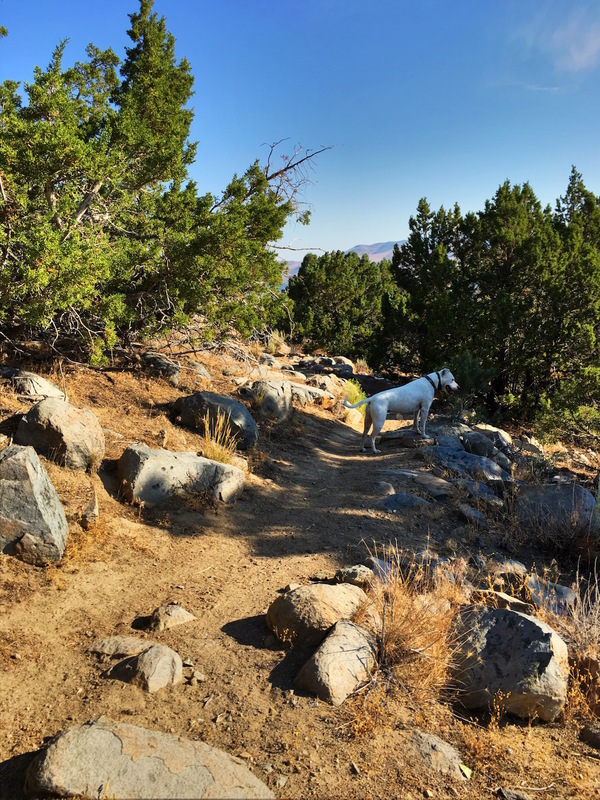 In fact, there’s no other place I’d rather be (at this time) that out on the trail with my Girl. I have to watch the heat because she overheats easily. But if the weather is moderate, then we can go for hours. Our normal morning walk is now five miles. If I push it and keep my pace at about 18 minutes/mile, I keep my metabolic rate up and it pushes her as well. We’re both tired (but maybe not done) when we get back to the rig. On Saturday, we did a bit more than five miles with terrain. The climb-out challenged my legs and glutes and it was good. The descent challenged my quads and put some pressure on the patellar tendon, which was also good. We were both tired when we got back to the rig, went to breakfast, and returned to our room. That was good. Saturday was a really good day! This morning we were out early again. It was cold down by the Carson River in Riverview Park. It was cold enough that my legs and hands were cold until the sun rose sufficiently to shine on me. With the cool air, I pushed pretty hard. The Girl had to run a few times to catch up. She’d be distracted by a scent, pause to sniff, and then notice I was 50 yards down the trail, calling and whistling to her to catch up. And then catch up she would, blasting by me to pick up the next trail or chase a rabbit. We hiked out to the Morgan Mill Road river access. We took a five-minute break there so I could eat a snack and pee. She continued snuffling in the willow brush, then came over to beg some of my snack (no chocolate for her!). I offered a bite of apple, but she declined (with a snort). After the short break, I donned my pack again and off we went, me jogging part of the way. I carried my walking stick a port-of-arms to practice. No, the stick isn’t a six-pound rifle, but it will do for practice. We hit the rig before 0800 with just over five miles on the clock. It was time to get back to the room, feed her, and get a shower so I could get to my dentist for a procedure. She was curled up in the back of the rig when I came out from the dentist’s office. I left with much to think about. The tooth I thought would be crowned will be extracted tomorrow. It’s cracked and cannot be salvaged. The price of the work just went up. I needed to think on this a bit more, consider the options, and make a decision about how to proceed. We stopped at Wally-World to fill my prescription. I pondered on my decision while we wandered through the store waiting for my prescription to be filled. I bought a strawberry shake (or what passes for a shake) and a cup of coffee from McDs in the Walmart and sat down to enjoy the coffee. I bought a deck of regular playing cards to keep in my kit. I think that sometimes just sitting playing solitaire will be good for me. I like real cards. After retrieving my meds, we headed for the room. It was good to feel the sun on my body and good to have the Girl curled up in the adjacent seatpan. I fiddled with her ears and stroked her side as we drove. Yeah, I’d rather be out in the sagelands with my Girl than nearly anywhere else these days. Wife is gone, the kids are grown and independent, I work for myself. The capture of us on the trail together is idyllic, at least to me. Yeah, I challenge my body when we do those hikes. Yeah, I get tired, hot, sweaty. Yeah, I feel the mental game to push the body when it rebels. It’s a different form of training, not as intense as strength training but just as big of a mental game. Yeah, I’m going to get the dental work done (yet another mental game), then recover from it, both physically and mentally. Then what? I’m not sure right now. I think there is work for me to do. I need to do some of it and replenish my savings account. I’m good with that… and with spending as much time as I can on the trail… with the Girl.